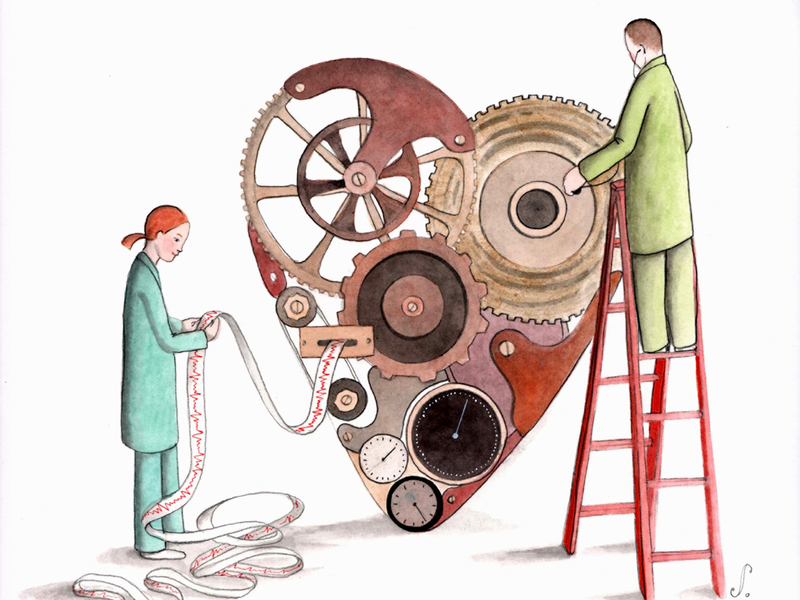 Is That Corporate Wellness Program Doing Your Heart Any Good? : Shots - Health News Most employers have a wellness program, but who knows if it's actually improving your health. The American Heart Association is proposing its own standards for improving cardiovascular health at work. Odds are your employer has a wellness program that prods you to exercise and eat healthy. But that program may not be doing all that much for your health, according to the American Heart Association, and attempts to measure the benefits of wellness programs often fail. When it comes to improving cardiovascular health, "most of the programs appear to be falling short," says Dr. Gregg Fonarow, a professor of cardiology at the University of California, Los Angeles, and lead author of the scientific statement, which was published Monday in the journal Circulation. There's no consistency in the scorecards used to evaluate workplace wellness programs, the review found, and most programs don't track employees' cardiovascular health. "They focus more on processes than on the actual health that's being achieved," Fonarow told Shots. For instance, the Centers for Disease Control's Worksite Health ScoreCard doesn't take into account employee health outcomes, the report says, while the National Business Group on Health's Wellness Impact Scorecard makes that a key metric. Since heart disease and stroke are the number one cause of death in the United States, that seems like a good place to start if you're trying to get workers to adopt healthy behavior. To that end, the heart association is launching its own set of criteria that employers can use to evaluate the worth of the wellness program they have, or of programs they're considering buying. The AHA standards are based on scientific evidence, Fonarow says, and emphasize measuring actions known to reduce risk, such as stopping smoking and being more active. Wellness programs are a big business, estimated at $6 to $10 billion a year, so there are a lot of vendors out there trying to sell wellness programs to employers. And there's fierce debate as to whether the programs actually save companies money by making employees healthier. 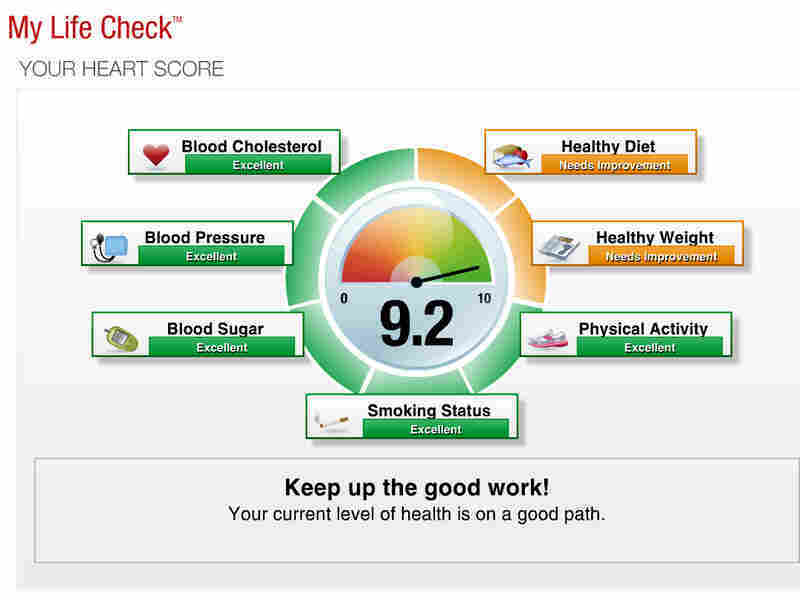 The "My Life Check" calculator gives a personalized readout on heart-healthy behaviors. The AHA also plans to offer a recognition program that employers can pay to join, but the basic measurement tools will be available for free or at nominal charge, AHA communications manager Jennifer Pratt says. If you're wondering how this will work, the heart association already offers a free online calculator that people can use to measure their wellness efforts, so you can use it now. "My Life Check" asks simple questions like how much you weigh and how much fruit you eat in an average day, and takes about three minutes to complete. I gave it a try. My results made me realize I haven't had my blood glucose checked in a while, and pointed out that I could stand to lose a few pounds. (I know, I know.) And it gave me an action plan with specific, reasonable advice, such as eating smaller portions and adding 15 minutes more a week of vigorous activity. Whether employers can make workers use these sorts of evidence-based metrics is an open question, though. Wellness programs that require employees and their spouses to get tested for cholesterol or blood glucose have come under fire, with the Equal Employment Opportunity Commission suing employers, saying that under federal law the programs must be voluntary. But at the very least, programs like the heart association's may help people get a better sense of whether their employer's wellness program is worth the effort, or if they'd be better off doing it themselves.